I am 45 and I haven’t ever put strawberries in a salad before – what have I been doing with my life? This is not so much a recipe as a collection of lovely things. 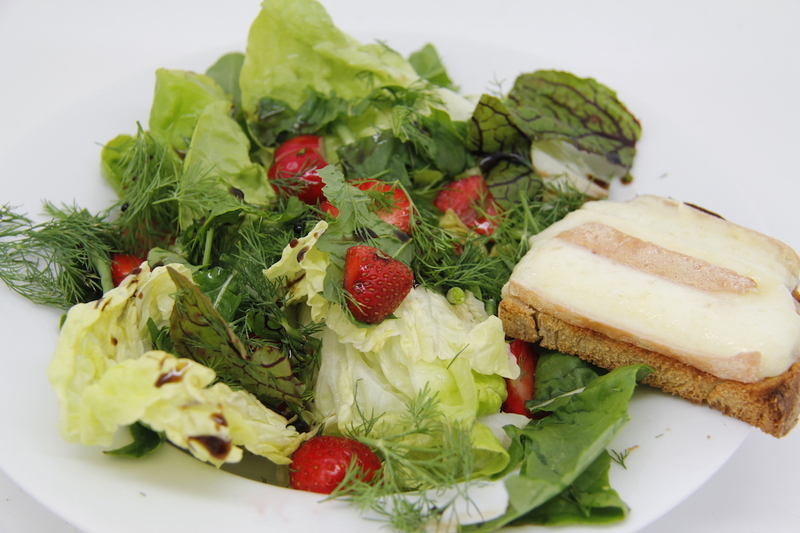 Strawberry and mixed leaf salad: lettuce, dill, sorrel, rocket, strawberries, balsamic vinegar, olive oil, cheese toasts to serve. Mix all the leaves together – really whatever you have in the garden – the sorrel is a good addition here though – and I am not just being smug because I have some in my garden – it really is! Add strawberries. Drizzle over some balsamic vinegar or some some delicious balsamic vinegar reduction thingy you got from a friend (thank you George) and a little olive oil, sprinkle with sea salt and eat. I had mine with a cheese toast made with the washed rind Cardo cheese, because even though I am 45 and haven’t added strawberries to a salad before, I do like my cheese! I have added apple before and pear, but never thought of strawberry – fruit is always a good thing I think.